Mothers’ Day was just last Sunday. Two of my sisters and I spent some time with our mom to celebrate with her. Among the presents we gave her, I made a dessert that is common in Mexico, but I adapted it to my own style. I made pastel helado (pas-ˈtel e-ˈla-do), which translates as frozen cake. 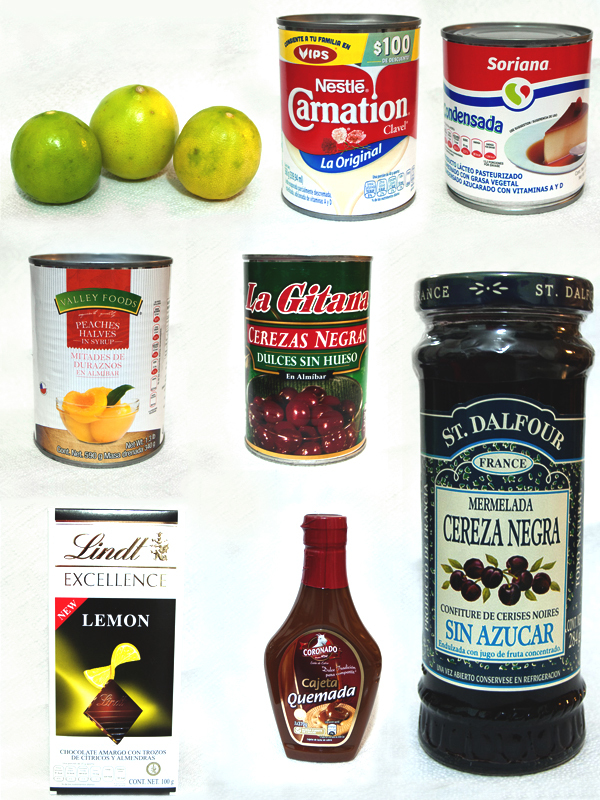 The basic ingredients are condensed and evaporated milk, limes and Maria cookies/biscuits. It is a pretty common recipe, but with a little bit of imagination, it is possible to make it more interesting. If you want to see the recipe right away scroll down or just click here. But if you allow me to give you some comments, you will be able to use them to create your own recipes of pastel helado. Today I’m sharing with you my recipe. For me pastel helado is like a canvas. Many people in Mexico make this dessert leaving the top completely empty. It depends on your creativity and imagination to create something interesting with the top of the pastel helado. When we talk about cooking, we need to consider several factors such as flavor, texture, presentation, colors, temperature, nutrition values, and more. For this recipe, I would like to talk about the first three. For this dessert, the question is which ingredients can you put in your recipe that can be combined with limes. There are some ingredients that may be common to mix them with limes. But if we open our options, you will see that there are some slightly sour ingredients that could be combined with limes too. Some of these can be strawberries, kiwis, pineapple, and others. However, once you put in so many sour flavors, you will need something sweet to soften the sharp flavors, and while doing it, keep in mind that they still have to go well with limes. How sweet? It should always be in proportion to the intensity of the sour flavors. This recipe has cajeta or dulce de leche. Cajeta and limes may sound strange, but what’s cajeta if not milk and sugar? And isn’t it condensed milk one of the main ingredients anyways? Try it first and then you can tell me. Eating has also a lot to do with texture. Some words that describe texture are crunchy, soft, firm, watery, etc. For my taste, pastel helado should have more consistency. Some others prefer it creamy-slushy. To add more consistency, I put the cookies and cookie layers tight together with each other. This part seems irrelevant to some people, but in reality eating is also a visual experience. Decorate your food too. In the case of my pastel helado, I may not have really stressed myself too much, but it doesn’t look too bad. I put all the peach slices towards one same direction with a black cherry on the inside of the curve. You will see what I mean once you see the pictures below. Having this in mind, you can do hundreds of combinations. Here is one of my recipes. 1 can of 340 g (11.9 oz.) of half or sliced peaches in syrup NOTE: I only used half of the can, you can use them all depending whether your pastel helado will be more spread than mine. Lime juice between 45 and 60 milliliters (1 and 2 oz.) or five juicy limes. NOTE: Keep in mind that lime juice acidity varies depending on how ripe limes are. This is important so you know in case you need to add more or less lime juice to the recipe. I used ripe and juicy limes. They had yellow tones (see picture below). 2 spoons (aproximately) of cajeta quemada (or burnt dulce de leche). 10 grams (0.35 oz.) of dark chocolate with citric and almond chunks. NOTE: I’m not a Lindt sponsor, I’m not affiliated with this brand, but they make chocolate with citric chunks. As an alternative, use any dark chocolate with 70% cocoa or more. The tenth part equals 10 grams. Marie cookies I used. 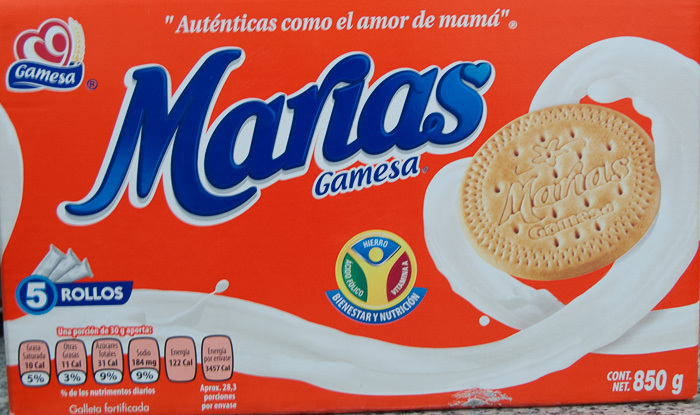 Galletas Marías by Gamesa is the most popular brand of this type of cookie in Mexico. Mix evaporated and condensed milk with lime juice. Try the milks first adding the lime juice gradually. Don’t add all the juice at once. As you add portions of the juice, taste the mix to see if you need more lime juice or not. Consider making the mix slightly stronger since the intensity will decrease once the pastel helado is frozen. 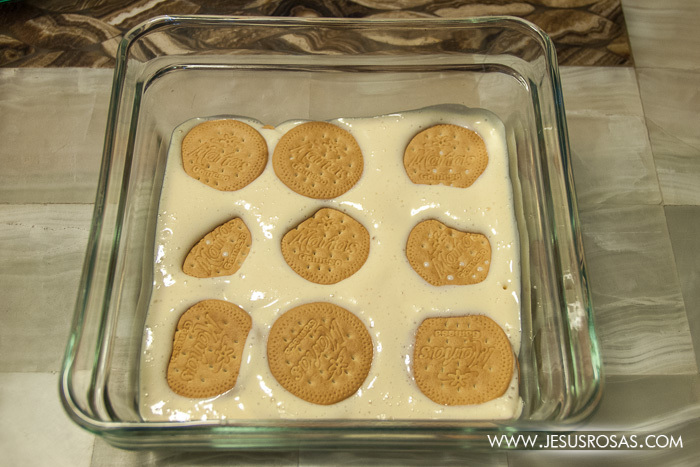 Inside a glass container, put a layer with cookies, add some of the milk and lime mix to cover, add another layer of cookies then mix, and so on. Push the cookies towards the bottom so they touch the previous layer and avoid empty spaces in between. You can add pieces of cookies in between to fill the empty spaces. Do this until you are done with the mix. Put several layers with the cookies. In this picture you see empty spaces between the cookies. I filled them with broken pieces of cookies. Make several layers until you finish the milk and juice mix. The part on the top should be completely covered. In my version, I prefer to have a more compressed dessert, meaning more consistency and this is why I avoid empty spaces between the cookies. The top is what varies from recipe to recipe. Here is my own style. 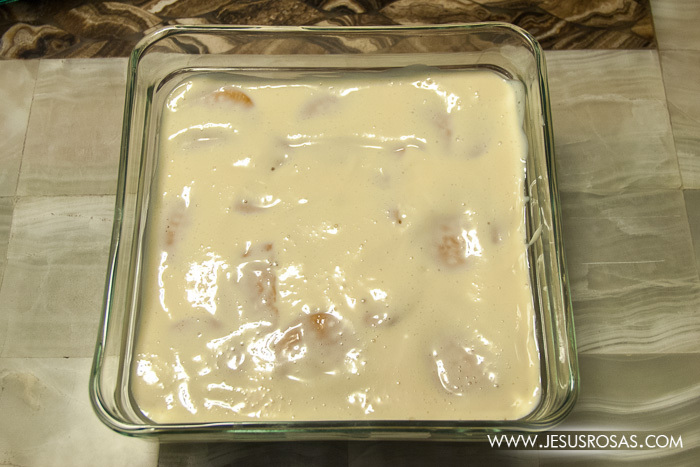 In this recipe take a small pot or pan and put a spoon of milk or so with the cajeta. Melt it in low fire. 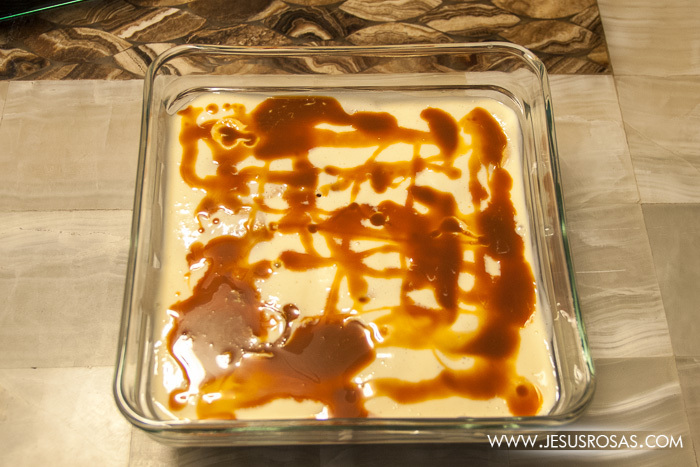 The idea is having a more watery cajeta to pour it on top of the dessert (see picture). 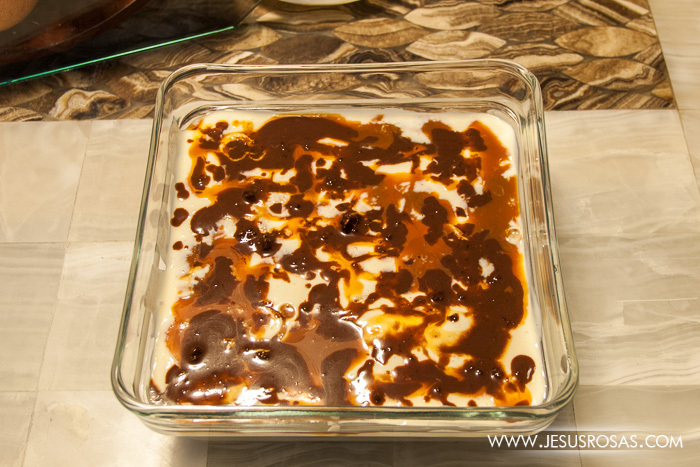 Melted cajeta quemada on top of the dessert. Use a spoon to pour it around. Do the same thing with the chocolate. Melt it with a spoon of milk and pour it on top of the dessert (see picture). Dark chocolate with citric and almond chunks melted on top of the pastel helado. 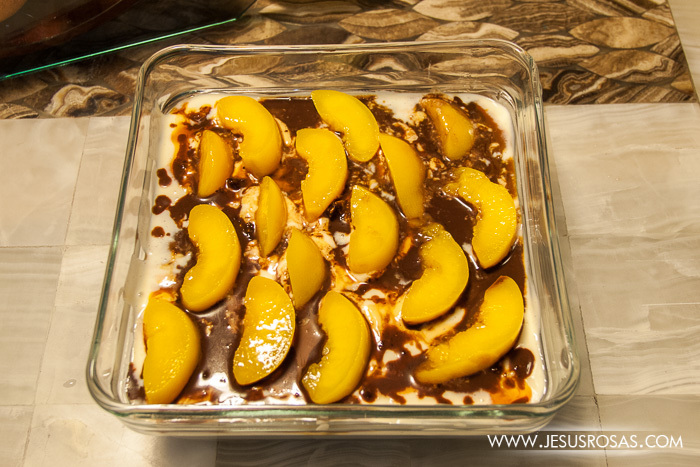 Add the peaches in the way you want to decorate it. If they are peaches cut in half then slice them. Peaches on top of the dessert. I put all slices facing the same direction, but you can create other shapes such as spirals, circles, squares, etc. Add some jam in the inside of the sliced peaches and top it with a black cherry each (see picture). 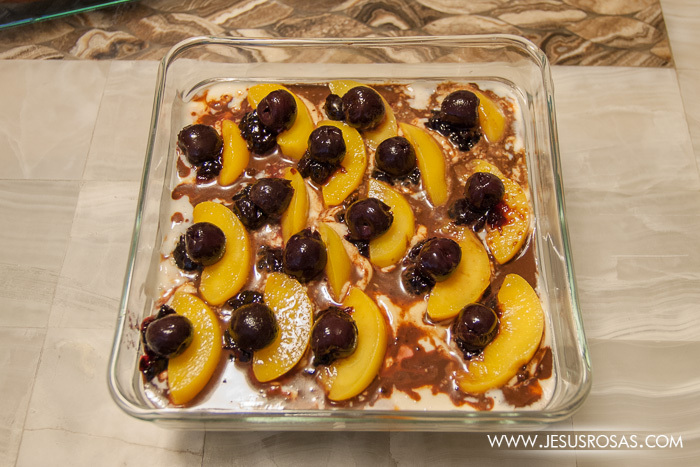 Add some jam to each slice of peach and top it with a black cherry. However, here is where your creativity goes. You can decorate in any way you want. Cover the container and put it in the freezer until it is frozen. Make sure you cover well the dessert, otherwise it will absorb the freezer smells making it taste really bad. I tend to leave the dessert all night, but maybe with two to four hours may be enough. And that’s it, you are ready to enjoy this delicious pastel helado. 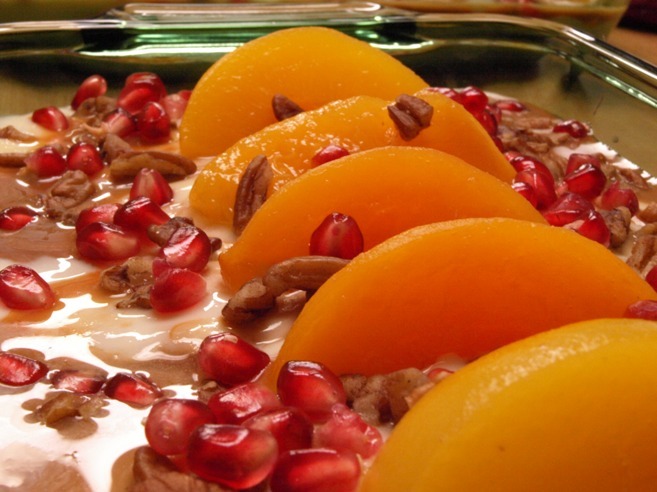 If you want another version, instead of black cherries, you can use pomegranate with pecans. In the next image you can see how it looked like when I made this a couple of years ago. And now that you know how to make this dessert, would you let me know how did it go? How did you like it? It would be really nice knowing how many tried this recipe and see your comments. You can share your responses in the comments section below. And lastly, if you would like to receive a notification about new content in this blog, click on the subscribe button below and enter your email address. You can always unsubscribe in case you later change your mind. If you liked this post, click on the Facebook or Twitter buttons below and share it.